New Delhi: India’s economic growth accelerated in the fiscal second quarter, spurred by higher output in both industry and agriculture and a rebound in exports, suggesting that the economy has bottomed out. Gross domestic product (GDP) expanded 4.8% in the three months ended 30 September, compared with 4.4% in the preceding quarter, data released by the government on Friday showed. 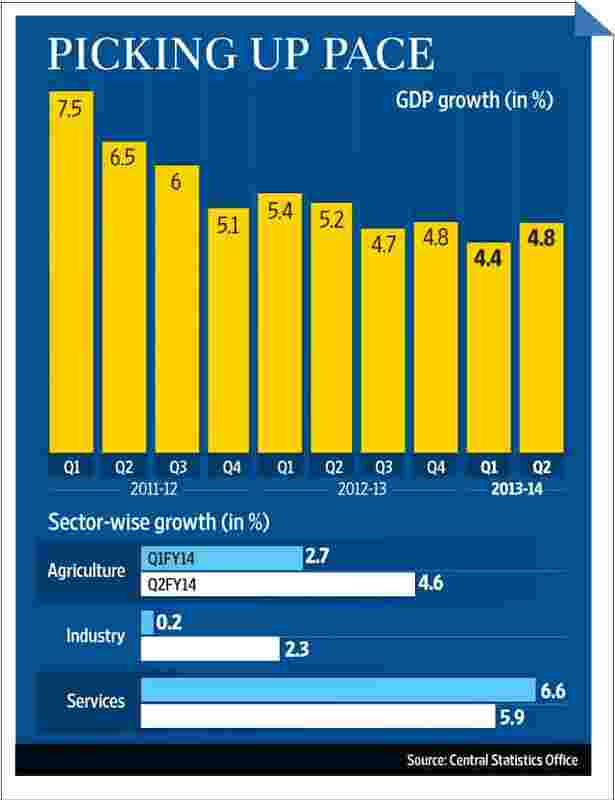 Agriculture grew 4.6% compared with 2.7% in the first quarter. Electricity production increased 7.7% against 3.7% during the same period. But growth in community, social and personal services, indicative of government expenditure, slowed significantly to 4.2% from 9.4% in the June quarter. The finance ministry expects GDP to grow 5-5.5% in the fiscal year to next 31 March. The economy grew 5% in the last fiscal year, the slowest pace in a decade, as companies put investments on hold and consumers cut back on spending in the face of high borrowing costs. Delays in mandatory government approvals hurt company cash flows, stalling projects. Economic affairs secretary Arvind Mayaram said the third and fourth quarters will see a pickup in growth to help attain a growth rate of at least 5% in the full fiscal year. “I have been saying that growth will come back slowly in third and fourth quarter. But I am glad that it is better than the first quarter," he said. Planning Commission deputy chairman Montek Singh Ahluwalia on Wednesday said he expects the GDP growth rate “in the second half of the current year to be better than (in) the first half". “I don’t think at the moment we have signs of a strong revival yet, but I do get a picture that people think that the economy has bottomed out, that many of the actions taken (by the government) will allow some investments to occur," Ahluwalia said on the sidelines of an event at the Indian School of Business in Hyderabad. The government has tried to revive economic growth by speeding up project approvals and liberalizing foreign direct investment norms in some sectors, including aviation and retail, in the past 14 months. Samiran Chakraborty, head of research at Standard Chartered Bank, said that although the worst may be over for the economy, a recovery will not be substantive. He expects overall growth this fiscal year to remain below 5%. Chakraborty said positive signals from the second quarter data included higher-than-anticipated farm output growth and robust exports growth. Data shows that due to a significant 16.3% jump in exports, GDP calculated from the demand-side (GDP at market price) grew faster than GDP calculated from the supply side (GDP at factor cost) after many quarters. GDP at market price grew at 5.6% in the second quarter compared with 2.4% in the first quarter. Crisil Ltd chief economist D.K. Joshi said this may lead to multilateral agencies such as the International Monetary Fund (IMF) that project GDP growth based on market price, to revise up their forecasts for India. IMF in October cut its 2013-14 growth projection for India to 3.8% at market price from 5.6% projected earlier. Joshi said there was a possibility that consumption demand will pick up in the second half of the fiscal year due to a boost coming from higher farm output and rural wages going up. However, he said no improvement was expected in investment demand. While gross fixed capital formation, representing investment demand in the economy, grew 2.6% in the second quarter compared with 1.2% in the first quarter, private consumption demand increased to 2.2% from 1.6% during the same period. Chakraborty does not think the 10% growth in financial services in the second quarter, compared with 8.9% in the first, is sustainable because it was driven by short-term borrowings by companies from banks. Rating agency Standard and Poor’s (S&P) said earlier this month that India’s sovereign rating could be downgraded to junk status next year if the government, in the run-up to the general election due by May 2014, does not take measures to revive stalled structural reforms, faltering economic growth, and the lower the stress of subsidies on state finances. The rating agency maintained its BBB minus rating with a negative outlook on India, its lowest investment grade. “The new government will face difficult tasks to place its fiscal accounts on a firmer footing: phasing out of diesel subsidies, financing the expansion of food subsidies, addressing other subsidies such as those for fertilizer, and introducing the nationwide roll-out of a common goods and services tax," S&P said in a statement. Slowing growth is “fraying the social contract and putting at risk the declining trend in government debt", S&P said. Data released separately by the Controller General of Accounts showed that in the first seven months (April-October) of the fiscal year 2013-14, the government exhausted 84.4% of its fiscal deficit target compared with 71.6% during the same period a year ago. S&P said meeting the fiscal deficit target this fiscal year will depend on government spending in an election year as well as the movement in commodity prices. India managed to keep its fiscal deficit at 4.9% of GDP in fiscal 2012-13 by sharply compressing Plan spending. This year, the government aims to keep the fiscal deficit down to 4.8% of GDP and has already announced steps to cut non-Plan expenditure by 10%. Analysts say the latest GDP data does not give any significant cues to the central bank, which may continue to tighten its guard against inflation by raising policy rates further in its monetary policy review due on 18 December. Both Joshi and Chakraborty said given current inflation dynamics, they expect the Reserve Bank of India to raise the repo rate again in December. Both wholesale and retail inflation accelerated in October to 7% and 10.09%, respectively, adding to the inflationary concerns of the central bank.